The Skinner Family Papers is a collection of documents, primarily letters, ranging from 1770 to 1900, housed at the University of North Carolina’s Southern Historical Collection. The Skinner Family Papers documentary editing project was accepted for publication by the North Carolina Office of Archives and History, Historical Publications Section, Raleigh, North Carolina, in 2006, and later suspended in 2010 due to budget restraints. In 2011, editor Mary Maillard took the Skinner Family Papers project to the summer Institute for the Editing of Historical Documents sponsored by the NHPRC and Association for Documentary Editing. 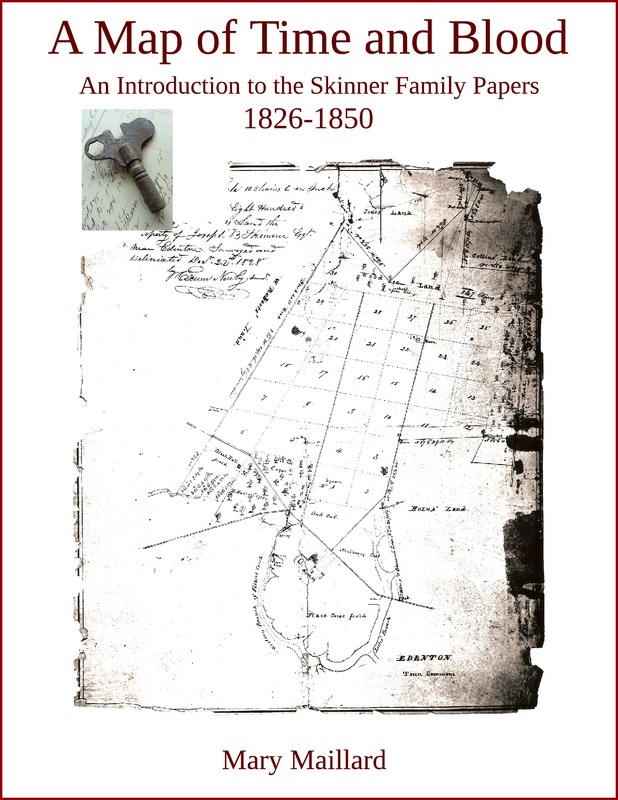 Maillard has selected a number of documents from the Skinner Family Papers for ebook publication and has written an introduction to the collection, A Map of Time and Blood: An Introduction to the Skinner Family Papers 1826-1850 (2014). 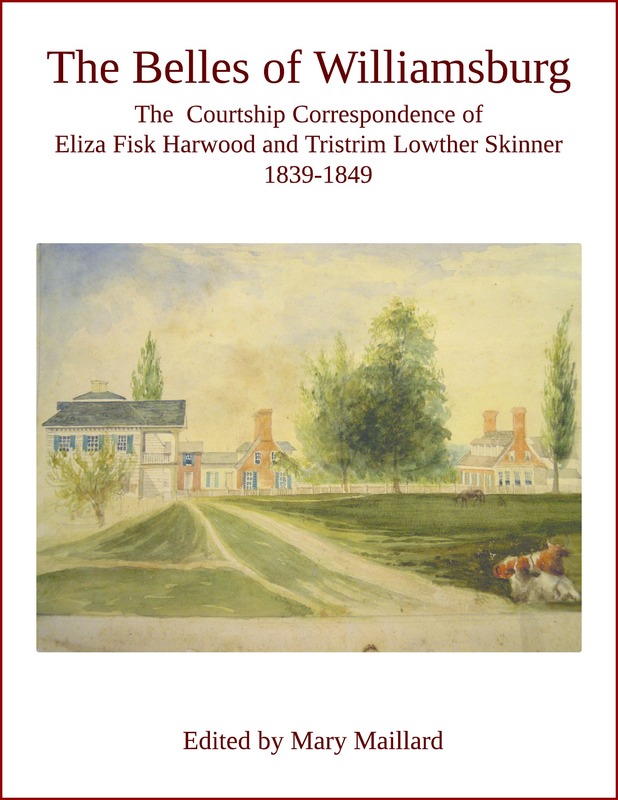 Two of the ebooks, The Belles of Williamsburg: The Courtship Correspondence of Eliza Fisk Harwood and Tristrim Lowther Skinner 1839-1849 (2015) and On the Carpet: The Coming of Age Letters of Penelope Skinner 1832-1840 (2014) underwent peer review. 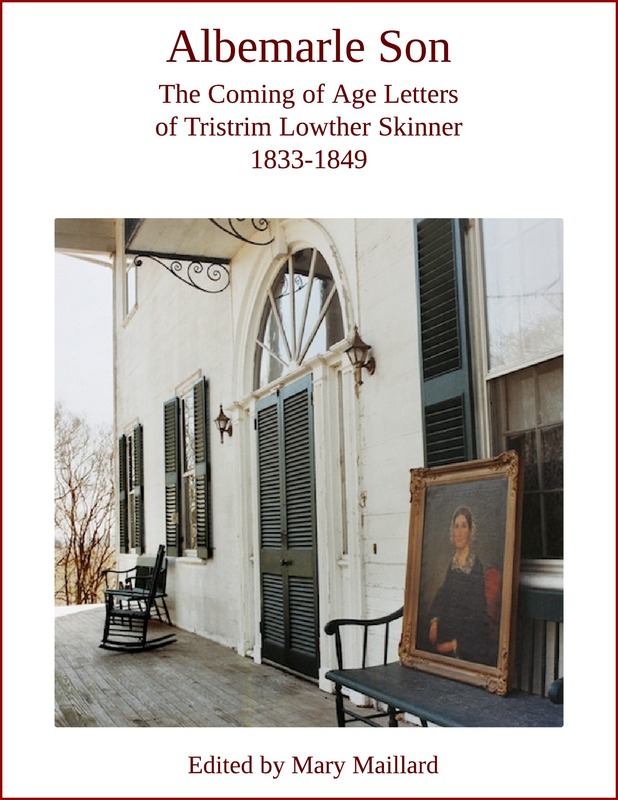 The documentary ebook project comprises three Coming of Age ebooks (2014, 2015) and The Civil War Letters of Tristrim Lowther Skinner 1861-1862 forthcoming in 2018. The Coming of Age ebooks present 213 documents and are comprehensive from 1832 through 1849. The fourth ebook, The Civil War Letters of Tristrim Lowther Skinner 1861-1862 (over 90 documents) is also a comprehensive collection. The project has been designed to allow different readers with different interests to approach the materials from any number of angles. 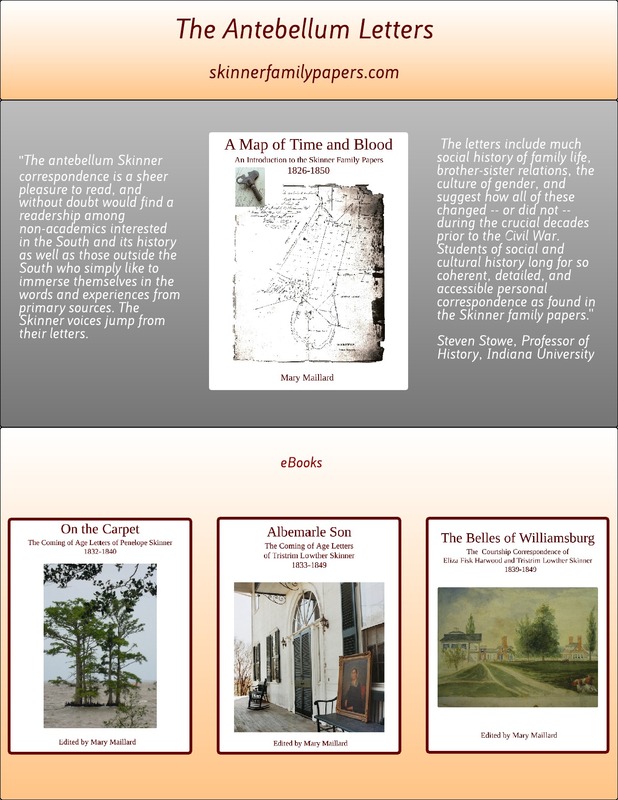 Anyone who reads the entire documentary ebook project will discover that some introductory material from A Map of Time and Blood: An Introduction to the Skinner Family Papers 1826-1850 has been partially duplicated in the introductions to the individual letter collections. A few primary source documents overlap in these ebook letter collections to ensure a continuous story. These include four letters jointly written by the Skinner children, four letters regarding Penelope Skinner’s courtship, six letters exchanged between Tristrim and Eliza on the eve of their marriage, and two afterwards. Otherwise, there is no duplication of letters among the antebellum ebooks. Tristrim Lowther Skinner’s coming of age correspondence is primarily between him and his father. Penelope Skinner’s letters are written mainly to her brother, Tristrim, and then, after her marriage, to her husband, Thomas Davis Warren. Eliza Fisk Harwood’s letters are written to her future husband, Tristrim Skinner. 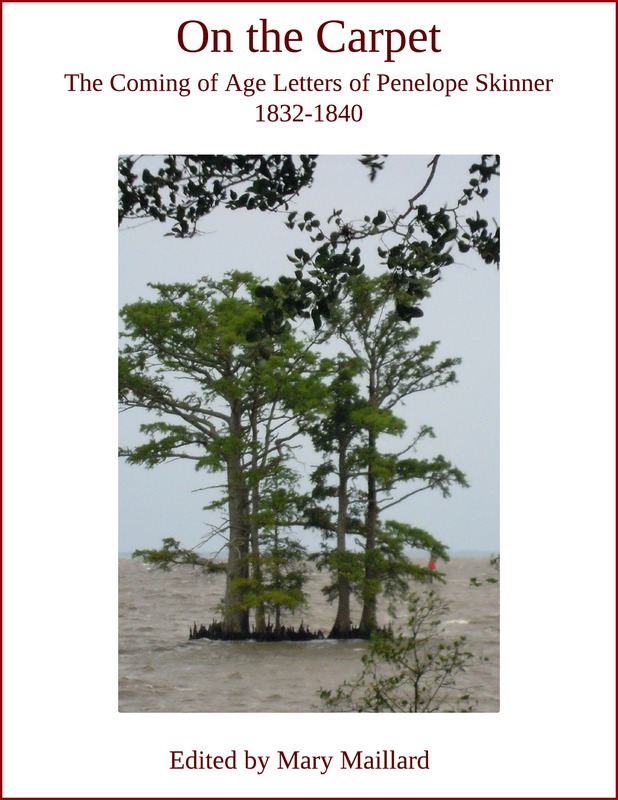 A Map of Time and Blood: An Introduction to the Skinner Family Papers 1826-1850 and the Coming of Age ebooks all share the same name index, acknowledgments, bibliography, and list of chronological documents. Through the hyperlinked name index and list of chronological documents, readers can see and access the larger project if they wish. Notes are extensive, ranging from brief biographical references to expansive entries that might inform the Skinners’ story. Slave lists from 1846, 1850, and 1860 have been digitized and transcribed, and appear on this site along with Skinner slave baptismal records from St. Paul’s Episcopal Church in Edenton. Mary Maillard lives in Vancouver. See reviews and photo credits.